Heal and Restore Your Pelvic Floor – Arcadia’s first online course! This course will enrich your knowledge about common problems such as bladder leakage or pain after childbirth, empower you to understand the causes and symptoms, and start taking action to resolve them. In tune with busy lifestyles, it is broken down into short sections while still giving evidence-based information and tried and tested strategies. If you just can’t get to a Physio, or if you want to start tackling taboo problems in the comfort of your own home, then this course is perfect for you. CLICK ON THE IMAGE ON THE LEFT TO ENROL NOW! There’s a lot of confusion about what the pelvic floor is, what it does, and what causes problems like incontinence. Get your head around the anatomy, the function and the behaviour of this intimate muscle group, and find out what happens when it goes wrong. To identify your individual issues, this section tells you how to explore your own pelvic floor, assess your strength, muscle tone, and record it in a useful way – either for your own self treatment or to take with you to a pelvic professional. A great section for data geeks – but super useful and often reassuring information you can gather yourself! This section introduces the bladder and bowel diary and shows you how you can measure your pelvic behaviour and analyse the data you gather. This is so important to set a starting benchmark which you can chart your progress against. Feeling stressed? Your pelvic floor will be feeling it too. Life throws a lot at us, and over time the pelvis can gather and hold a lot of emotional tension or reactive behaviours. This section encourages you to gently explore the journey your pelvis has been through, from society’s message about sexuality, to childbirth, trauma, menopause and surgery. You may be surprised by the emotions it stirs and give you an appreciation of how connected your mind and your body really are. The accepted wisdom in the public eye is that everything will be OK as long as you strengthen your pelvic floor. This is simply not the case – the pelvic floor needs to be able to release and stretch and relax if it is to give you a good contraction and proper support. 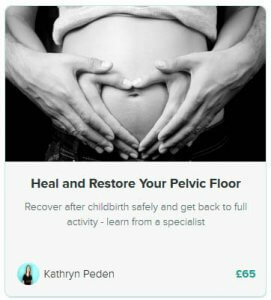 This section gives you tried and tested techniques for giving the pelvic floor some TLC, and strategies to use for life to nourish and protect your pelvis for years to come. When you’ve mastered the ability to relax, then the strengthening can begin. This section explains how muscles gain bulk, how to monitor your progress, and what tips and tools you can use to make progress and get back to your activities. Are Your Ribs Trapped in their Own Cage?